In 1943, although the end of the last war was still two years away, the thoughts of the London County Council were focussed on the post war reconstruction of the city. London had yet to suffer the barrage of V1 and V2 weapons, but in 1943 the London County Council published the County of London Plan, a far reaching set of proposals for the post-war development of the city. I find the many plans for London that have been published fascinating to read. They show the challenges of trying to forecast the needs of a city such as London for decades to come. They provide a snapshot of the city at the time, and they demonstrate that time after time, development of London has reverted to ad-hoc rather than grandiose, city wide schemes. “This is a plan for London. A plan for one of the greatest cities the world has ever known; for the capital of an Empire; for the meeting place of a Commonwealth of Nations. Those who study the Plan may be critical, but they cannot be indifferent. Our London has much that is lovely and gracious. I do not know that any city can rival its parks and gardens, its squares and terraces. but year by year as the nineteenth and twentieth centuries grew more and more absorbed in first gaining and then holding material prosperity, these spaces were over-laid, and a tide of mean, ugly, unplanned building rose in every London borough and flooded outward over the fields of Middlesex, Surrey, Essex, Kent. Athens was the glory of Greece, Rome the great capital of a great Empire, a magnet to all travellers. Paris holds the hearts of civilised people all over the world. Russia is passionately proud of Moscow and Leningrad; but the name we have for London is the Great Wen. It need not be so. Had our seventeenth century forefathers had the faith to follow Wren, not just the history of London, but perhaps the history of the world might have been different. The 1943 plan provides plenty of detailed analysis of London at the time, with some graphical presentation using techniques I have not seen in any earlier London planning documents. The following diagram from the report provides a Social and Functional Analysis of London. 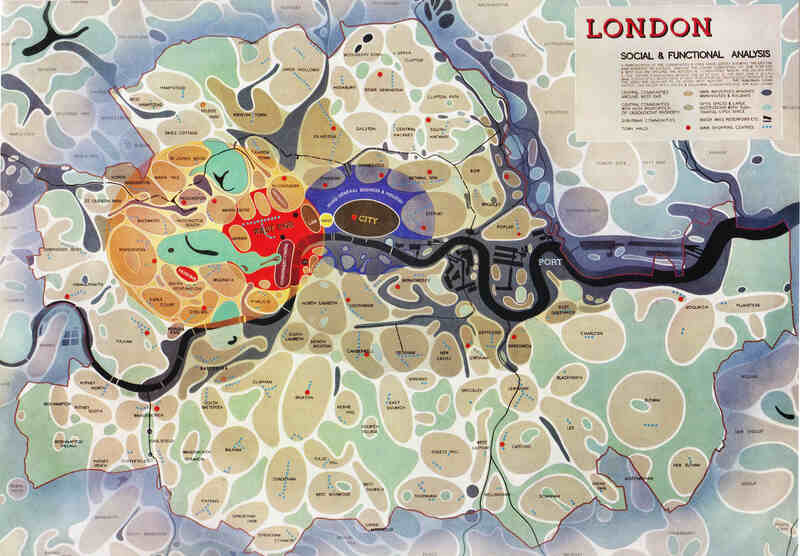 This divides London into individual communities, identifies the main functions of the central areas, shows town halls, man shopping centres and open spaces. The City is surrounded by an area of “Mixed General Business and Industry”. Press (Fleet Street) and Law (the Royal Courts of Justice) provide the main interface between the City and the West End, which also contains the University and Government areas of the city. “The social group structure of London is of the utmost importance in the life of the capital. Community grouping helps in no small measure towards the inculcation of local pride, it facilitates control and organisation, and is the means of resolving what would otherwise be interminable aggregations of housing. London is too big to be regarded as a single unit. If approached in this way its problems appear overwhelming and almost insoluble. 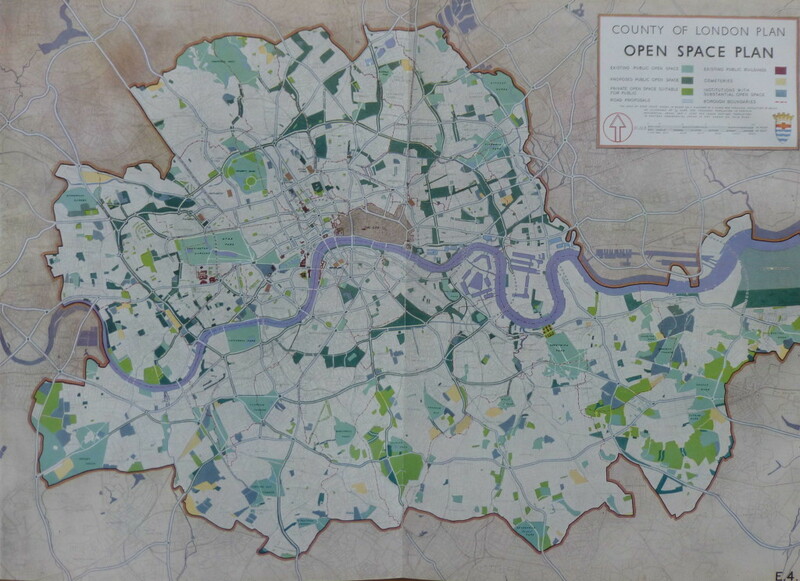 The following map shows a more traditional view of the Communities and Open Spaces within the Greater London area. The plan identifies a number of issues that divide communities, chief among them the way that railways, mainly on the south of the river have divided local communities with railway viaducts acting as a wall between parts of the same community. The plan used the following photo of the railway viaducts on the approach to Cannon Street Station and down to Waterloo to illustrate the impact. 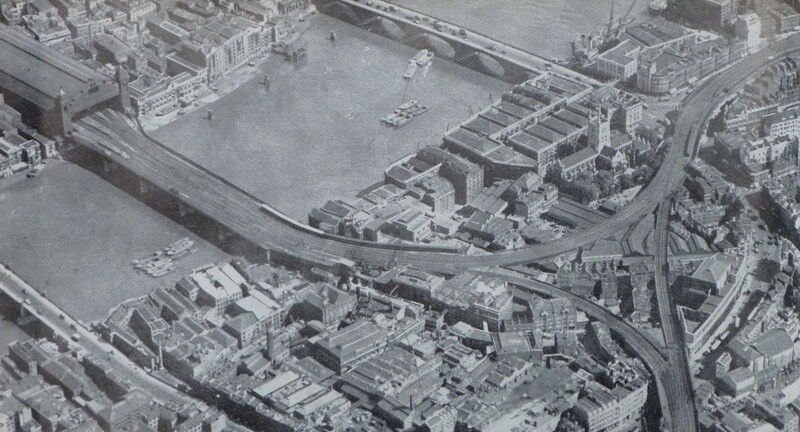 The report, as with a number of other proposals for the post war development of London, placed considerable importance on moving the over ground railways into tunnels to remove viaducts, bring communities together and to remove rail bridges, such as the one shown leading into Cannon Street Station, from across the Thames. 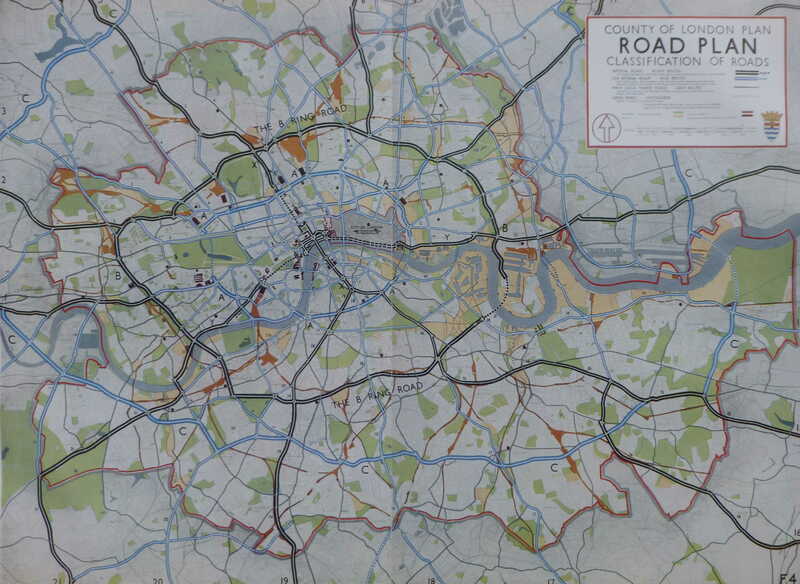 The plan also emphasises the dangers resulting from traffic on London roads with in 1937 a total of 57,718 accidents in the Greater London area that involved personal injury. Parking this number of cars was also expected to be a problem. The plan includes the provision of underground car parks and that legislation should be passed that enforces the provision of car parking facilities for all buildings of a certain size. A new ring road was planned for fast moving traffic. This is shown as the B Ring Road in the following map. 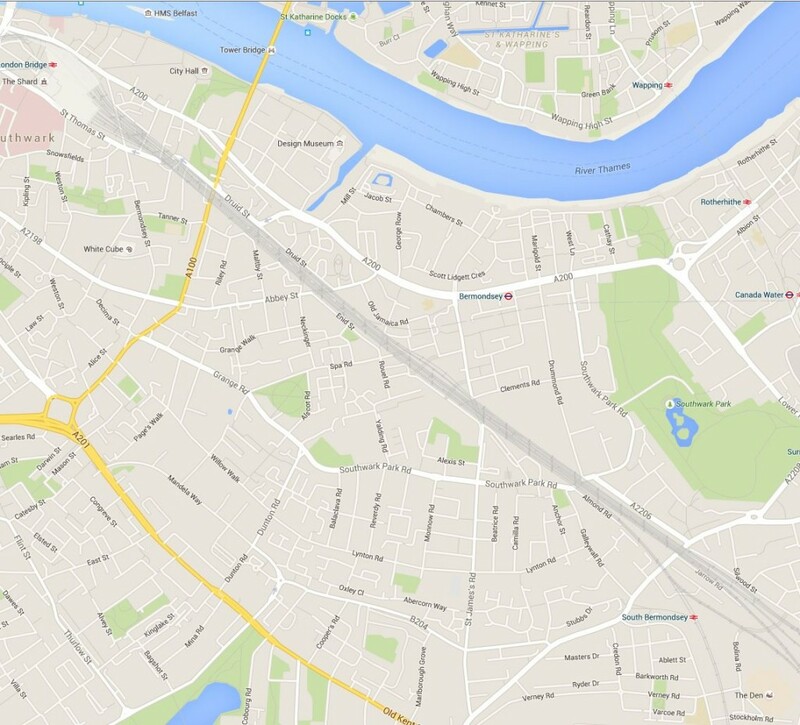 Circling the central area of London and with a tunnel under the Thames running from the Isle of Dogs to Deptford. Roads radiating out from the B Ring Road would allow traffic circulating around London to quickly leave to, or arrive from the rest of the country. 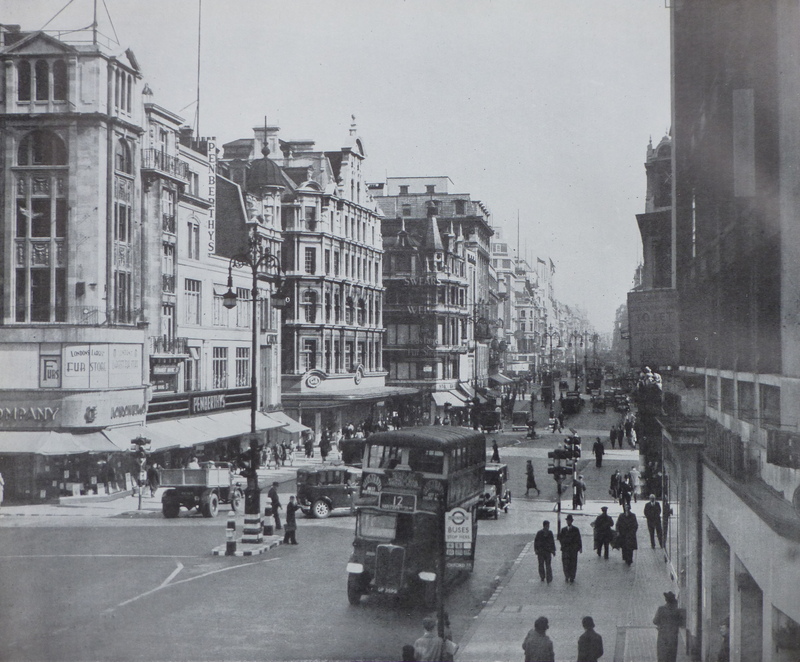 The plan also identifies the “cumulative effect of street furniture on the appearance of London and on the convenience of pedestrians and vehicular traffic is very considerable” and recommends the formation of a Panel to provide a degree of control over street furniture, with a preference for embellishing streets with tree-planting and green-swards. With the level of street furniture on the streets today, perhaps a Panel to control this would have been a good outcome. The provision of more open space was seen as a key component of the future development of London with the standardised provision of space for Londoners. At the time the plan was written there was a considerable variation in the amount of open space available to Londoners in different boroughs, for example the inhabitants of Woolwich benefited from the availability of 6 acres per 1,000 inhabitants, whilst for those of Shoreditch the amount of open space available was 0.1 acres per 1,000 inhabitants. The provision of 4 acres of open space for every 1,000 inhabitants across London was adopted as a key strategy for future development. Examples of how open space could be made available to the public included the use of Holland Park, the grounds of the Hurlingham Club and the Bishops Palace Grounds in Fulham. Indeed at Hurlingham, after the war, the London County Council made a compulsory purchase of the polo grounds to build the Hurlingham Park recreation grounds, along with the Sullivan Court flats and a school, leaving the Hurlingham Club with the 42 acres retained today. The plan also states that “The difficulty of finding alternative housing accommodation for people displaced when open spaces are provided in built up areas, has been partly removed through the destruction of many houses by bombing.” I am not sure what the view of those who had lost their homes through bombing would have been, that there was a plan to replace their homes with open space. 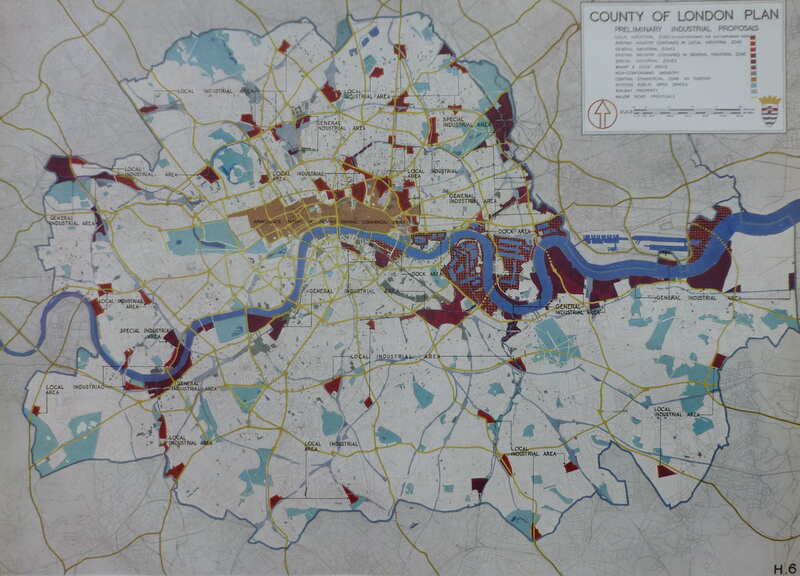 The 1943 plan presents a fascinating view of the industrialisation of London. The East End of London and the London Docks were well known industrial areas, however every London borough had a significant amount of factories and industrial employment. The report includes a summary of industry for every London borough. I have shown a sample below to indicate the range of factory numbers, employment levels and types of industry across some of the London boroughs. The plan identifies a trend of decentralisation which had already being happening for a number of decades with the gradual migration of industry from central to outer London and also identifies the improvement in transport facilities as enabling industry to move away from the main residential areas. Even in 1943 the report identifies the importance of the new industrial estates at Slough, Park Royal, along the Great West Road etc. as the future home for more of London’s industry. What the plan does not identify is how the Docks would change over the coming decades. The expectation was that the London Docks would continue to provide a key role in both London and the Nation’s global trade. The following map shows the proposed approach for how industry would be located across the Greater London area. 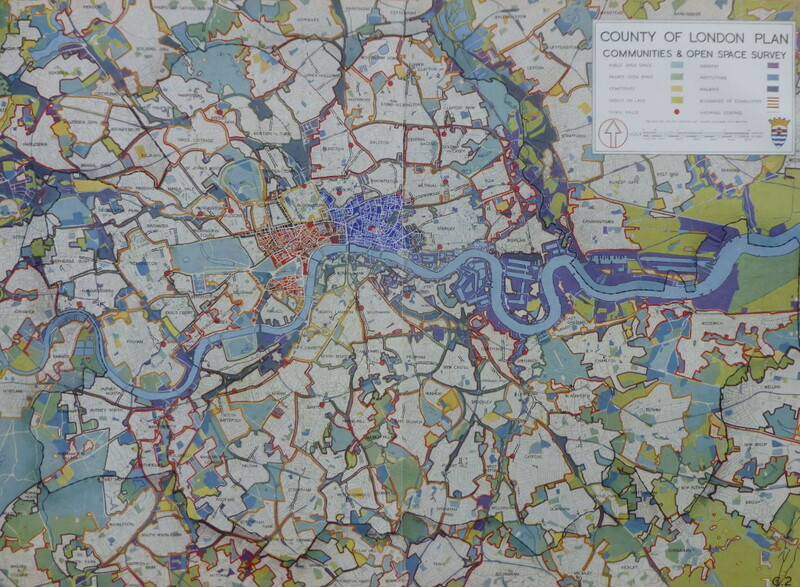 Note the concentration of industrial areas around the Docks and along the Thames. 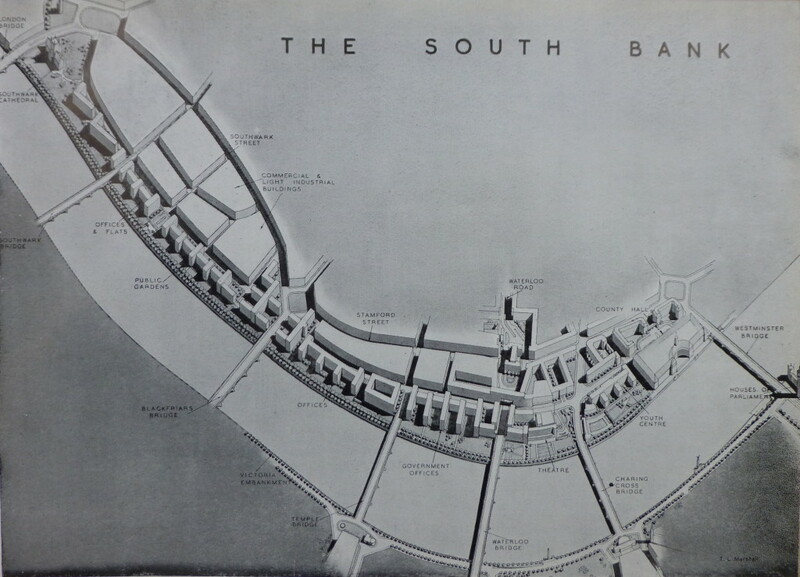 In addition to planning at the Greater London level, the 1943 report also focussed on a number of specific areas that had suffered extensive bomb damage and were therefore important redevelopment locations. How far these plans were actually implemented after the war can be judged by comparison with the following 2015 map of Bermondsey. The railway viaducts still remain, cutting across the borough, and the street layout remains largely unchanged. Southward Park provides a large amount of open space, however there is not the amount proposed in 1943 and the large park planned to run adjacent to the Old Kent Road was not constructed. When reading the plan I was really surprised to find that in 1943 there were proposals for a bridge across the river at Temple. Although this would have been more functional than the proposed Garden Bridge, it would still have blocked some of the view from Waterloo Bridge and the South Bank across to St. Paul’s and the City. 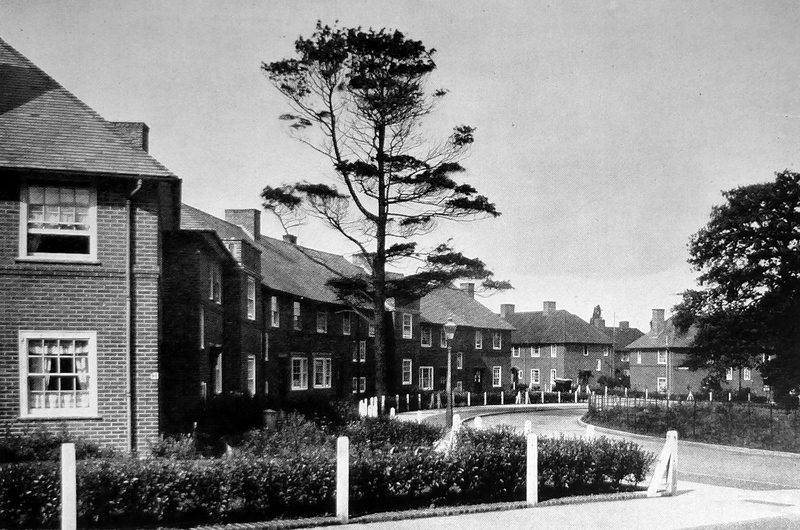 The 1943 report places considerable importance on the need for housing after the war, claiming that “Of the many aspects of London’s future in so far as replanning is concerned, that of housing must claim first attention.” and that “The provision of new housing accommodation will be a most urgent task to be tackled immediately after the war.” Some things do not change, although in 1943 the plans for housing in central London were very much the provision of affordable housing for Londoners rather than the endless development of luxury apartments we see today. 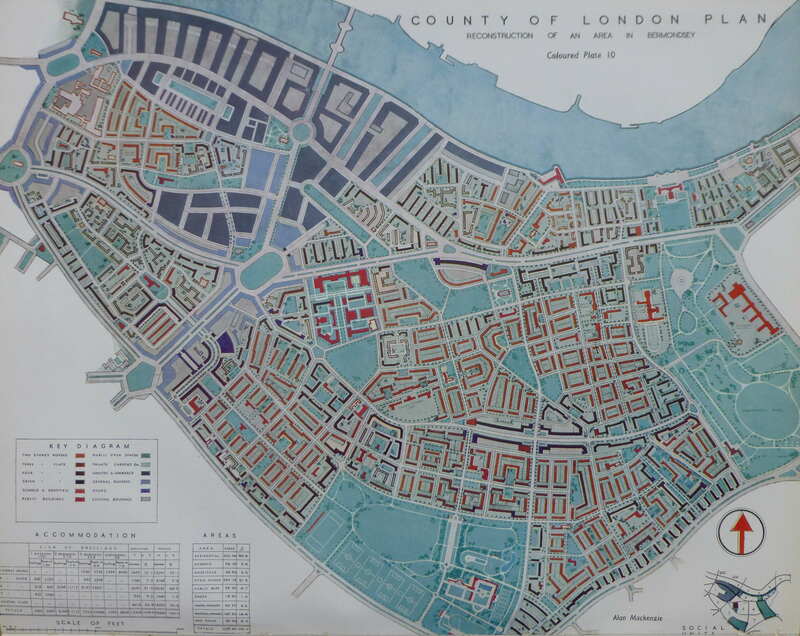 The 1943 plan proposes a comprehensive housing plan to address the need to improve the housing conditions for Londoners as well as providing the number needed. 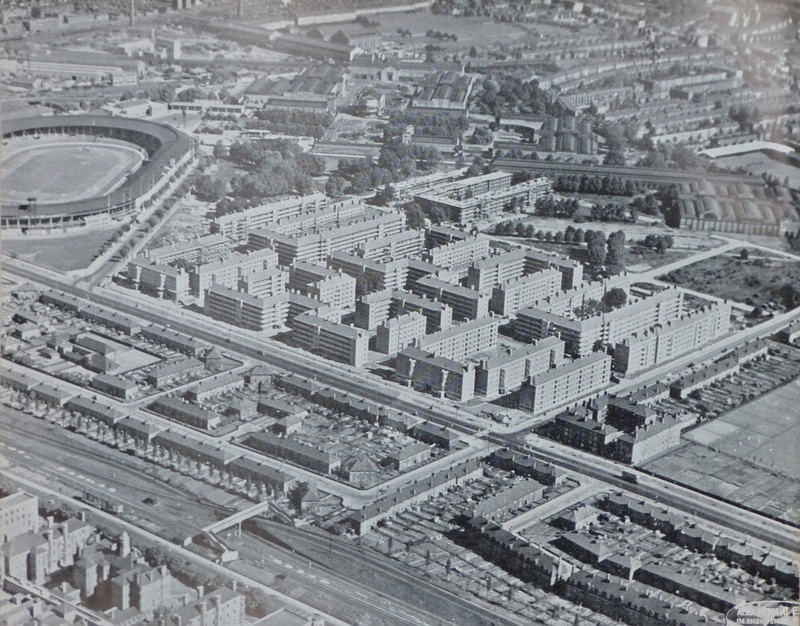 The following photo from the 1943 plan shows some of the building commenced prior to the war. This is the White City Housing Estate, Hammersmith. Construction started in 1936 and was suspended in 1939. The plan states that when work recommences, the estate will cover an area of 52 acres and comprise 49, 5 storey blocks with accommodation for 11,000 people. The plan recommends “that Panels of architects and planners might be set up to assist the planning authority in the application of a control for street design, similar to those already in operation in other countries, notably in America and Scandinavia. Cornice and first floor levels, as well as the facing materials used, should be more strictly controlled so as to give a sense of continuity and orderliness to the street”. The 1943 plan is a fascinating read, not only covering London at the time, but also how London could be today if these plans had of been adopted in full. I have only been able to scratch the surface of the report in this week’s post. Reading the plan it is clear that some issues do not change, for example housing and traffic congestion. The plan does seem to rule out the construction of a large airport within the central London area as this would be “inimical to the interests and comfort of large sections of the population to embark on a scheme of this kind” The post war development of Heathrow was not considered in 1943. In many ways I am pleased that many of the plans for the large scale redevelopment proposed in the 1943 plan did not take place. As with Wren’s plans for the City after the Great Fire, London tends to avoid large scale planning and seems to evolve in a haphazard manner which contributes much to the attraction of the city, although I feel that this is now under threat with the rows of identical towers that seem to be London’s future. This entry was posted in London Books, London Streets, London Transport and tagged 1943, Bermondsey, County Of London Plan, South Bank, Temple Bridge on August 30, 2015 by admin. A great read and very interesting. Thank you. Thanks for the feedback Tony, really appreciated. Collectively, the two reports are usually referred to as “The Abercrombie Plan” for London. Abercrombie was knighted in 1945. Thanks Rob for pointing this out. Not sure how I forgot to include the author of the plan. I will update the post. I have the plan of the ‘suggested scheme for shops with flats over at Parkersburg Row, Bermondsey S.E.1, for J. Oxtey Parker, Esq.’ and am wondering if you would be interested to have a look? The architect was Gorden Marriott of 9 Stafford Gate, Potters Bar, Middlesex, who was my father. I have the plan of the ‘suggested scheme for shops with flats over at Parkers Row, Bermondsey S.E.1, for J. Oxtey Parker, Esq.’ and am wondering if you would be interested to have a look?